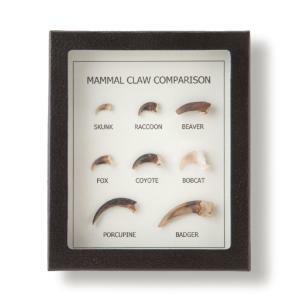 Compare claw forms between north american mammals. Compare and contrast the claws from eight different North American mammals with this diverse set. Whether they are used to climb trees, catch prey, or dig up a meal, the claws that an animal has can tell you a lot about its lifestyle. Specimens typically include Skunk, Raccoon, Beaver, Fox, Coyote, Bobcat, (American) Porcupine, and Badger, but exact specimens may vary with availability.